This paper presents an integrated approach for tracking hands, faces and specific facial features (eyes, nose, and mouth) in image sequences. For hand and face tracking, we employ a state-of-the-art blob tracker which is specifically trained to track skin-colored regions. In this paper we extend the skin color tracker by proposing an incremental probabilistic classifier, which can be used to maintain and continuously update the belief about the class of each tracked blob, which can be left-hand, right hand or face as well as to associate hand blobs with their corresponding faces. 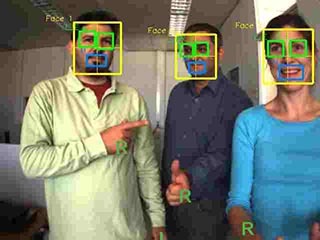 An additional contribution of this paper is related to the employment of a novel method for the detection and tracking of specific facial features within each detected facial blob which consists of an appearance-based detector and a feature-based tracker. 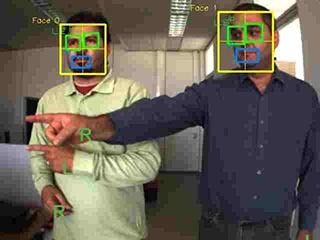 The proposed approach is intended to provide input for the analysis of hand gestures and facial expressions that humans utilize while engaged in various conversational states with robots that operate autonomously in public places. 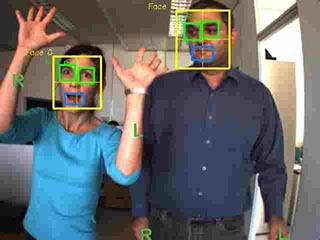 It has been integrated into a system which runs in real time on a conventional personal computer which is located on a mobile robot. Experimental results confirm its effectiveness for the specific task at hand.